A Peace and tranquility, beautiful nature as far as the eye can see! Peace and tranquility, beautiful nature as far as the eye can see, with the low hum of weird and wonderful creatures and a light evening breeze, place to come if you want to meditate, clear your head and heal, and soak up the atmosphere of ancient spirits. It also a perfect place for honeymooners. 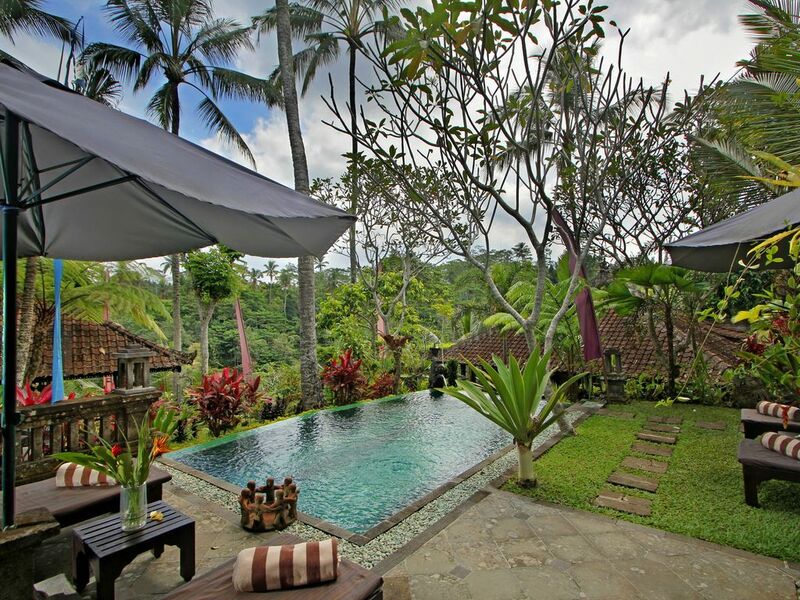 The place invites not only to relax, to get to know Balinese food, and do sightseeing trips, it’s more to it. Founded in the traditional Balinese village of Sumita where you will not only be surrounded by Bali's natural landscapes but you will also see the rural life of farmers and you will certainly hear and see the daily Balinese ceremonies at the temples, giving you the full authentic Balinese experience. It’s real life here. You will be warmly greeted by a Buddha sculpture upon entering through the Balinese gate at the villa. The stone steps with manicured garden around it will lead you down the beautiful valley to the villa's pavilions. On the edge of the cliff you will find a stunning infinity pool with size of 6 m x 2 m length and 1, 5 m depth. Rather small but nice with little Jacuzzi jets and good for cooling down on the hot days. Deck chairs are available for sunbathe on the loungers or read a book in the shade of the parasol. The Buddha terrace by the pool is also another great place to relax and have drinks at the antique table and chairs, surrounded by greenery, Buddha sculptures and the impressive jungle valley in front of you. This is a good opportunity to explore Balinese dishes. Unlike many villas, we can offer all meals (breakfast is included in the rate and a menu offers lunch and dinner selections at a modest additional cost). We can cater in a modest and understanding way to special dietary needs, including gluten free and vegetarian cuisine with advance notice. All food and beverage items are charged at cost price, plus an additional 20% service charge. Guests are requested to provide cash in advance; staff will then purchase the goods and keep receipts for reference. Costs are tallied up at the end of the stay, but can be checked on a day-to-day basis if preferred.